Right, the time has come to Get On With It, which is to say I got out a drill and put a wire brush in it and spent half an hour removing rust from the frame of John's High Racer that has languished these months on the workshop floor, tripping me up and generally getting in the way because I'm too untidy to find a place for it and too disorganised to finish it. The rear triangle, it will be recalled, fell off a perfectly good gentleman's mountain bicycle when a hacksaw was judiciously applied. The main frame is a two inch 18-gauge mild steel tube because it's cheap, available, weldable, and has proven strong enough in 12 of the 32 machines I've built. (I've just counted them. I think the number's right, unless I've forgotten some, which is likely since my memory is rubbish.) The other 20 machines were strong enough - my ego has just told me to clarify the point - but didn't use two inch tubing. Okay, this machine - reminding myself - is to be high enough to be seen by the driver of EMM397 - a grey BMW, the Ultimate Driving Machine - who stopped me to tell me I was invisible, one of those delicious ironies of which the General Public are capable, and it has 26 inch wheels because I have an abundance of them and of the frames whence they came, and it has rear suspension because I don't fancy adding it later when John discovers the pleasure of comfort. The BB is 6.5 inches above the sitzhöhe to minimise frontal area, and it has a straight chainline so I don't need idlers. You can get a straight chainline with big wheels. It's one of the advantages. The sticky-up bit at the back is to assist in alignment and will be sawn off later. The swing arm pivot is wide because I have experienced rear swing arms twisting under hard cornering, and the reason I didn't use large diameter bushes in the BB shell is because I'm stupid and didn't think of it in time. 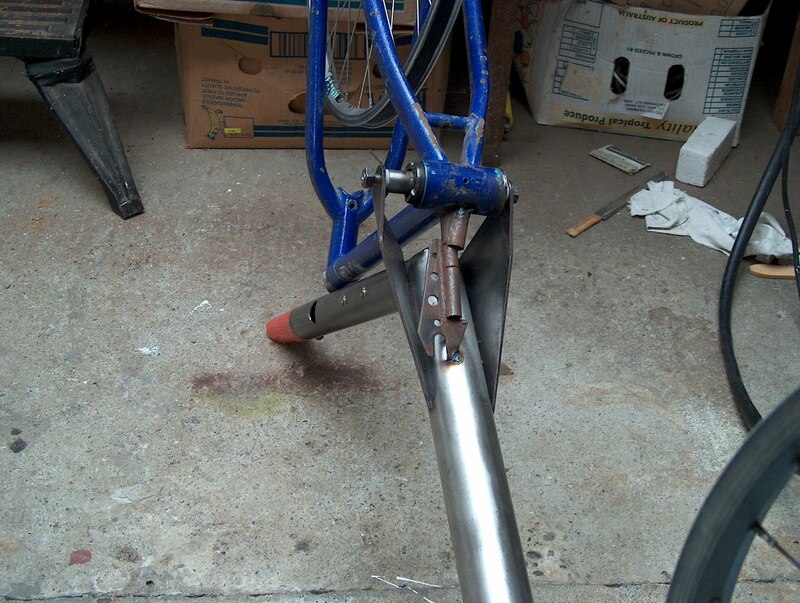 The wide bearing is offset to the left so it doesn't interfere with the chain line. The welly boots in the background are because there was a torrential rainstorm last night, so torrential that they called off the Iron Man competition round Lake Taupo suggesting a depressingly obvious pun. We are getting lots of Weather here in the Pacific yet never once does anyone on the radio dare mention the words 'climate' and 'change' in the same sentence, and indeed it amazes me how completely people block this issue out of their heads, given the implications of what the Royal Society (warning: pdf.) tell us. - Well it doesn't amaze me actually. It's all to be expected. - But let us not give way to gloomy thoughts. Let us hope for better things. Let us flatter ourselves that I may be the survivor. 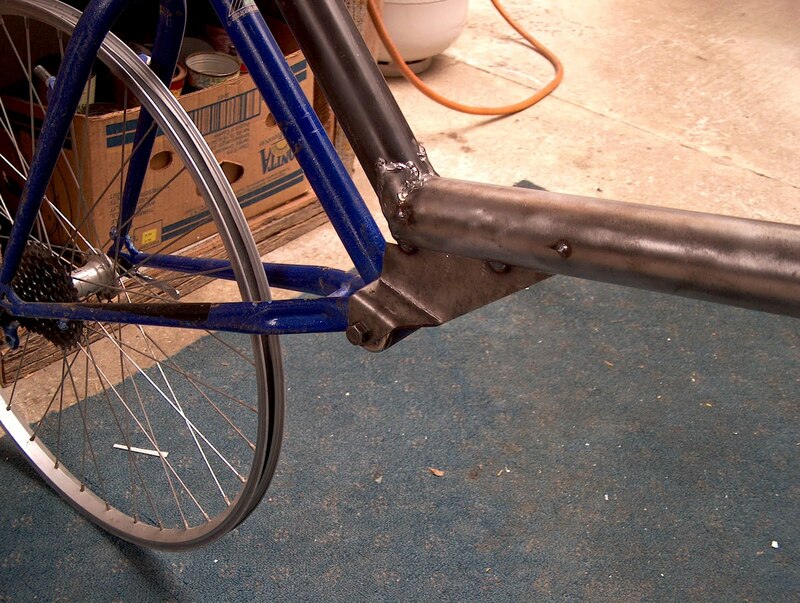 There are two methods of aligning front and back wheel. The first is to bolt each set of drop-outs to the lathe bed of a Dean Smith & Grace weighing five tons, and the second is to tack-weld one side-plate and then wrestle with the rear swing arm while simultaneously welding the other side plate and not electrocuting myself at the same time eyeing everything up to make sure it's in line. This, naturally, is difficult. But it is easier than taking the whole contraption 44 kilometres away to the nearest Dean Smith & Grace which in any case I wouldn't be allowed to use as a welding jig because - well, I don't suppose I need say why. 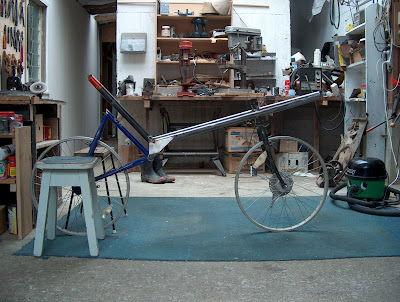 Anyway, with the aid of John, who is tolerant of his father's heated vocabulary during this sort of procedure, I got it all tack-welded up and then I fitted two wheels and then I set it up as shewn (why d'you have to spell it 'shown' these days?) and then I held up a front triplet such that the innermost chainring was the statutory 37mm off the centreline and then I saw that the chain would run straight through the RH side-plate because I was so focussed on the profile of the bike that I forgot about the salient fact that chains move sideways when derailleurs are applied. How many machines have I built thus far? First arrange for CT scan to see if cranium still houses brain. 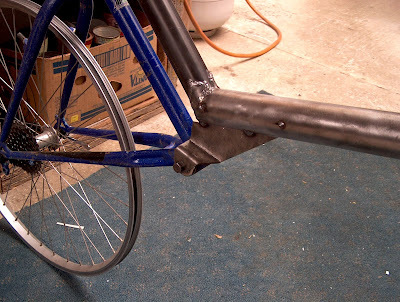 Then tack-weld the triangle to the mainframe with judicious additions of scrap-iron. Then snap off the RH side-plate; cut out template from an old tin; put plaster on finger where sharp end of tin penetrated blood vessel because I am too impatient to put leather gloves on & do the job safely; bend template; mark and bend RH sideplate; saw and file excess steel off-ov same; bolt everything back together and re-weld; and finally cut off the scrap iron and un-tack-weld the rear triangle. Didn't take very long, but this is why when Her Majesty gets round to handing me a peer's patent, which has thus far slipped her mind, I am going to take the title Lord Foolish McIdiotperson. You could always turn it into a FWD High-racer - of course the McLeod Idler would be compulsory! McLeod Idler would not be compulsory if you made it MBB! thank you for this wonderful lecture and especially for taking time to share it with us in Industrial Products Clark with photos attached.